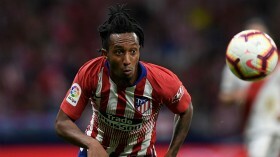 Arsenal are reportedly going head-to-head with Thierry Henry's Monaco to acquire the services of Gelson Martins from Atletico Madrid this month. The 23-year-old, who was a target for the Gunners in the summer, has been tipped to make way alongside Nikola Kalinic in the near future with Atleti looking to finance their move for Chelsea's Alvaro Morata. According to The Star, Gunners legend Henry is keen on recruiting the Portuguese for Monaco this month but the team are primed to face competition from ex-employers Arsenal. However, Unai Emery's side still remain on the backfoot with regards to a permanent deal, given the board have not allocated any transfer kitty for the current transfer window. Martins, who has made a single league star for Atleti, could be the subject of an initial loan approach from the north London giants with the obligation to buy when the season comes to a close.